With the DVD110 Deluxe DVD Player you can continue to access and play hundreds of hours of instructional content stored on CDs and DVDs for individual and small group use in classroom, library and lab settings for lessons, meetings and multimedia presentations. 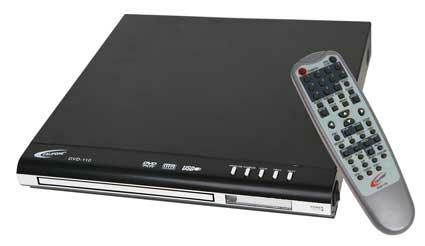 The front-loading DVD player covers a range of needs for higher performance and teaching content. Of critical importance for beginning instrumental, dance and language students is the ability to slow down the playback of modeled material to better assimilate the content. The DVD-110 enables you to control the speed of play to one of seven playback speeds (full speed plus 1/2X, 1/3X, 1/4X, 1/5X, 1/6X, and 1/7X speeds). It also has a full-function remote so you can move about the class, band room or language lab and still control what's seen and heard by students on the monitor or screen. Production, transferring and dissemination of student and teacher-generated digital materials has enabled more students to be creators of content instead of consumers. The DVD-110 supports this with its built-in USB port so files can be played from a connected device or thumb drive. The DVD-110 has all of the necessary digital and analog audio and video outputs to connect with a monitor or classroom projector and sound system to engage the entire class.